Microsoft is set to borrow a page from Android's playbook, by moving its capacitive physical buttons within the touchscreen display on the forthcoming Windows Phone 8.1 update. A leaked screenshot published on Twitter by @evleaks (who else?) revealed the Back, Windows and Search buttons within the display, rather than the physical buttons beneath the touchscreen. It's a feature Google adopted within Android 4.0 Ice Cream Sandwich a couple of years back and now it seems Microsoft is ready to jump on board. According to reports, Microsoft believes the option to ditch the capacitive buttons will lower costs for Windows Phone handset manufacturers, as simpler hardware designs will be possible. A Galaxy with Windows Phone? 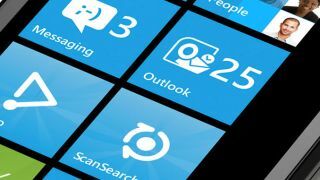 It's not just the removal of the physical buttons that would lower costs for manufacturers, it would also allow them to launch more similar versions of their Android-based handsets for the Windows Phone OS. Could we see the likes of HTC and Samsung launch versions of their popular One and Galaxy hardware ranges running Windows Phone 8.1? Microsoft is set to reveal more about Windows Phone 8.1 at its Build conference in April next year, so it'll be a while before we find out for sure whether this weekend's leak will come to fruition. Bond-themed devices to kickstart the Windows Phone 8.1 roll out?